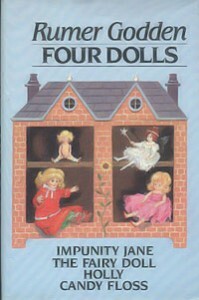 For any fans of Rumer Godden, this collection of four doll stories is a great find. This is a sparsely illustrated children’s book, allowing the imagination and beauty of each story to shine forth. Each story was originally published as an individual children’s book, and later, Rumer Godden herself created this collection of them. It is utterly entrancing in each story to be inside the heart and mind of a doll, or the little girl or boy who is taking care of the doll. Each story is unique, each doll is different, and yet what they all share is the magic of dolls made alive by love, and the power of wishing. There’s no way you cannot believe in this magic, as Rumer Godden just makes it true for the reader. Some of the language might need explanation for non-British children, but that adds to the magical feel of the writing. This children’s book is a perfect read-aloud children’s book for age 4 and older. I think it would be fun to read-aloud even when your little one can read a bit on their own, as the stories are perfect for bedtime. Each story has some great lessons as well, and I particularly loved the Fairy Doll for illustrating transformation in a child. Since this children’s book was published a while ago, your best buy is a used copy, as the collection is not in print currently. However, the individual stories are still in print.